Not to be confused with Rock art. Art rock is a subgenre of rock music that generally reflects a challenging or avant-garde approach to rock, or which makes use of modernist, experimental, or unconventional elements. Art rock aspires to elevate rock from entertainment to an artistic statement, opting for a more experimental and conceptual outlook on music. Influences may be drawn from genres such as experimental rock, avant-garde music, classical music, and jazz. Its music was created with the intention of listening and contemplation rather than for dancing, and is often distinguished by the use of electronic effects and easy listening textures far removed from the propulsive rhythms of early rock. The term may sometimes be used interchangeably with "progressive rock", though the latter is instead characterized in particular by its employment of classically trained instrumental technique and symphonic textures. Art rock emphasizes Romantic and autonomous traditions, in distinction to the aesthetic of the everyday and the disposable embodied by art pop. Larry Starr and Christopher Waterman's American Popular Music defines art rock as a "form of rock music that blended elements of rock and European classical music", citing the English rock bands King Crimson, Emerson, Lake & Palmer, and Pink Floyd as examples. Common characteristics include album-oriented music divided into compositions rather than songs, with usually complicated and long instrumental sections, symphonic orchestration. Its music was traditionally used within the context of concept records, and its lyrical themes tended to be "imaginative" and politically oriented. Differences have been identified between art rock and progressive rock, with art rock emphasizing avant-garde or experimental influences and "novel sonic structure", while progressive rock has been characterized as putting a greater emphasis on classically trained instrumental technique, literary content, and symphonic features. Compared to progressive rock, art rock is "more challenging, noisy and unconventional" and "less classically influenced", with more of an emphasis on avant-garde music. Similarities are that they both describe a mostly British attempt to elevate rock music to new levels of artistic credibility, and became the instrumental analog to concept albums and rock operas, which were typically more vocal oriented. Art rock can also refer to either classically driven rock, or to a progressive rock-folk fusion. Bruce Eder's essay The Early History of Art-Rock/Prog Rock states that "'progressive rock,' also sometimes known as 'art rock,' or 'classical rock'" is music in which the "bands [are] playing suites, not songs; borrowing riffs from Bach, Beethoven, and Wagner instead of Chuck Berry and Bo Diddley; and using language closer to William Blake or T. S. Eliot than to Carl Perkins or Willie Dixon." In the late sixties and early seventies, rock both co-opted and challenged the prevailing view of musical art, often at the same time. This is evident in a diverse body of music that includes the Beach Boys' Pet Sounds and the Beatles' Sgt. Pepper; Frank Zappa's Freak Out ... the Who's rock opera Tommy; Pink Floyd's technologically advanced concept album Dark Side of the Moon; and Miles Davis's jazz/rock fusion. The boundaries between art and pop music became increasingly blurred throughout the second half of the 20th century. The first usage of the term "art rock", according to Merriam-Webster Online Dictionary, was in 1968. As pop music's dominant format transitioned from singles to albums,[nb 1] many rock bands created works that aspired to make grand artistic statements, where art rock would flourish. As it progressed in the late 1960s – in tandem with the development of progressive rock – art rock acquired notoriety alongside experimental rock. The earliest figure of art rock has been assumed to be record producer and songwriter Phil Spector, who became known as an auteur for his Wall of Sound productions that aspired to a "classical grandiosity". According to biographer Richard Williams: "[Spector] created a new concept: the producer as overall director of the creative process, from beginning to end. He took control of everything, he picked the artists, wrote or chose the material, supervised the arrangements, told the singers how to phrase, masterminded all phases of the recording process with the most painful attention to detail, and released the result on his own label." Williams also says that Spector transformed rock music as a performing art into an art that could only exist in the recording studio, which "paved the way for art rock". The Beach Boys' leader Brian Wilson is also cited as one of the first examples of the auteur music producer. [nb 2] Like Spector, Wilson was known as an eremitic studio obsessive who laboriously produced fantastical soundscapes through his mastery of recording technology. Biographer Peter Ames Carlin wrote that Wilson was the forerunner of "a new kind of art-rock that would combine the transcendent possibilities of art with the mainstream accessibility of pop music". Drawing from the influence of Wilson's work and the work of the Beatles' producer George Martin, music producers after the mid 1960s began to view the recording studio as a musical instrument used to aid the process of composition. Critic Stephen Holden says that mid-1960s recordings by the Beatles, Spector and Wilson are often identified as marking the start of art pop, which preceded the "bombastic, classically inflected" art rock that started in the late 1960s. Many of the top British groups during the 1960s – including members of the Beatles, the Rolling Stones, the Kinks, the Who, the Move, the Yardbirds and Pink Floyd – came to music via art school. This institution differed from its US counterpart in terms of having a less industry-applicable syllabus and in its focus on furthering eccentric talent. By the mid-1960s, several of these acts espoused an approach based on art and originality, where previously they had been absorbed solely in authentic interpretation of US-derived musical styles, such as rock 'n' roll and R&B. According to journalist Richard Goldstein, many popular musicians from California (like Wilson) desired to be acknowledged as artists, and struggled with this aspiration. Goldstein explains that the line between violating musical conventions and making "truly popular music" caused those who didn't have "strong enough egos" (in contrast to Bob Dylan and the Beatles) to be "doomed to a respectful rejection, and a few albums with disappointing sales usually meant silence. ... They yearned for fame, as only needy people can, but they also wanted to make art, and when both of those impulses couldn’t be achieved they recoiled in a ball of frantic confusion." Author Matthew Bannister traces "the more self-conscious, camp aesthetic of art rock" to pop artist Andy Warhol and the Velvet Underground, who emulated Warhol's art/pop synthesis. Accordingly: "Warhol took Spector's combination of the disembodiment, 'distance' and refinement of high culture with the 'immediacy' of mass cultural forms like rock and roll several stages further ... But Warhol’s aesthetic was more thoroughly worked out than Spector's, which represented a transitional phase between old-fashioned auteurism and the thoroughly postmodern, detached tenets of pop art. ... Warhol's approach reverberates throughout art rock, most obviously in his stance of distance and disengagement." The December 1965 release of the Beatles' Rubber Soul signified a watershed for the pop album, transforming it in scope from a collection of singles with lesser-quality tracks to a distinct art form, filled with high-quality original compositions. The album garnered recognition for the Beatles as artists from the American mainstream press, anticipating rock music's cultural legitimization as an art form. Writing in 1968, Gene Sculatti of Jazz & Pop recognized Rubber Soul as "the definitive 'rock as art' album" and "the necessary prototype" that major artists such as the Rolling Stones (with Aftermath) and the Beach Boys had felt compelled to follow. The period when rock music became most closely aligned with art began in 1966 and continued until the mid 1970s. Academic Michael Johnson associates "the first documented moments of ascension in rock music" to the Beach Boys' Pet Sounds and the Beatles' Sgt. Pepper's Lonely Hearts Club Band (1967). Released in May 1966, Pet Sounds came from Wilson's desire to make a "complete statement", as he believed the Beatles had previously done with Rubber Soul. [nb 3] In 1978, biographer David Leaf wrote that the album heralded art rock, while according to The New York Observer, "Pet Sounds proved that a pop group could make an album-length piece comparable with the greatest long-form works of Bernstein, Copland, Ives, and Rodgers and Hammerstein." Pet Sounds is also noted as the first rock concept album. [nb 4] In 1971, Cue magazine described the Beach Boys as having been "among the vanguard" with regard to art rock, among many other aspects relating to the counterculture, over the period up to late 1967. Jacqueline Edmondson's 2013 encyclopedia Music in American Life states that, although it was preceded by earlier examples, Frank Zappa and the Mothers of Invention's debut album Freak Out! (June 1966) came to be seen as "the first successful incorporation of art music in a pop context". The writers note also that, with Los Angeles as his base since the early 1960s, Zappa was able to work in an environment where student radicalism was closely aligned with an active avant-garde scene, a setting that placed the city ahead of other countercultural centres at the time and would continue to inform his music. Writer and pianist Michael Campbell comments that the album "contains a long noncategorical list of Zappa's influences, from classical avant-garde composers to obscure folk musicians". The Beatles' Revolver (August 1966) furthered the album-as-art perspective and continued pop music's evolution. Led by the art-rock single "Eleanor Rigby", it expanded the genre's scope in terms of the range of musical styles, which included Indian, avant-garde and classical, and the lyrical content of the album, and also in its departure from previous notions of melody and structure in pop songwriting. According to Rolling Stone, "Revolver signaled that in popular music, anything – any theme, any musical idea – could now be realized." As with Rubber Soul, the album inspired many of the progressive rock artists of the 1970s, and each of its songs has been recognised as anticipating a new subgenre or style. Clash Music names the Velvet Underground's debut March 1967 album The Velvet Underground & Nico "the original art-rock record". [nb 5] Bannister writes of the Velvet Underground: "no other band exerted the same grip on the minds of 1970s/1980s art/alternative rock artists, writers and audiences." Their influence would recur from the 1970s onwards to various worldwide indie scenes,[nb 6] and in 2006, The Velvet Underground & Nico was inducted into the Library of Congress' National Recording Registry, who commented: "For decades [it] has cast a huge shadow over nearly every sub-variety of avant-garde rock, from 70s art-rock to no-wave, new-wave, and punk." However, when the Velvet Underground first appeared in the mid 1960s, they faced rejection and were commonly dismissed as a "fag" band. In 1982, musician Brian Eno famously stated that while The Velvet Underground & Nico initially sold just 30,000 copies, "everyone who bought one of those 30,000 copies started a band." The Beatles' Paul McCartney deemed Pet Sounds "the record of the time", and in June 1967, the band responded with their own album: Sgt. Pepper's,[nb 7] which was also influenced by Freak Out! AllMusic states that the first wave of art rock musicians were inspired by Sgt. Pepper's and believed that for rock music to grow artistically, they should incorporate elements of European and classical music to the genre. [nb 8] Many British groups flowered in the album's wake; those who are listed in Music in American Life include the Moody Blues, the Strawbs, Genesis, and "most notably", Pink Floyd. [nb 9] The band's Roger Waters later stated that both Sgt. Pepper and Pet Sounds "completely changed everything about records" for him. Art rock's greatest level of popularity was in the early 1970s through British artists like King Crimson and Queen. Enthusiasm for art rock explorations waned in the mid 1970s. From then to the 1990s, art rock was infused within various popular music genres. Encyclopædia Britannica states that its genre's tendencies were continued by some British and American hard rock and pop rock artists, and that Brian Eno's late 1970s and early 1980s collaborations with David Bowie and Talking Heads are exemplary of "the successful infusion of art rock tendencies into other popular music genres". Bowie and Eno collaborated on a series of consecutive albums called the "Berlin Trilogy", characterized as an "art rock trifecta" by Consequence of Sound, who noted that at the time of their release, "The experimental records weren’t connecting with audiences on the scale Bowie was used to. ... New Wave had exploded, and a generation of Bowie descendants had taken the stage." In the 1980s, a new generation of English art rockers took the place of 1970s bands like Yes, Genesis, Jethro Tull and Emerson, Lake & Palmer. Journalist Roy Trakin explains: "Of course, these stalwarts can still fill Madison Square Garden and sell a great many records, as they always have, but their days of adventurous risk-taking and musical innovation are long gone - replaced by the smug satisfaction of commercial success." Trakin identifies XTC as one of the more "accessible" new groups. When the band's Colin Moulding was asked whether he felt the band was closer to art rock or new wave, he responded; "We've always had the art-rock appeal rather than street credibility. ... I'd like to think we're the Vasco de Gamas [sic] of popular music, exploring new grounds. This band has never really been fashionable at all." ^ The Beatles, the Beach Boys, Phil Spector, and Frank Zappa all indicated a direction that transformed long-playing records into a creative format while variously reciprocating each others' creative developments throughout the 1960s. ^ For an early example of the rock album format being used to make a cohesive artistic statement, author Scott Schinder refers to the album The Beach Boys Today! (1965) and its "suite-like structure", consisting of one side of uptempo songs and the other of ballads. ^ Carys Wyn Jones observes that Pet Sounds, the Beatles' Revolver (1966) and Sgt. Pepper, and the Who's Tommy (1969) are variously cited as "the first concept album", usually for their "uniform excellence rather than some lyrical theme or underlying musical motif". ^ In late 1966, the Velvet Underground's principal songwriter Lou Reed praised Spector, crowning his "You've Lost That Lovin' Feelin'" (1964) "the best record ever made". In addition, he wrote: "There is no God and Brian Wilson is his son." ^ Bannister adds that indie rock musicians would be significantly influenced by the "pop" offshoots of psychedelia that includes the later Beatles, the later Beach Boys, the Byrds, early Pink Floyd, and Love. ^ In the Encyclopedia of Popular Music, Colin Larkin wrote of Sgt. Pepper: "[It] turned out to be no mere pop album but a cultural icon, embracing the constituent elements of the 60s' youth culture: pop art, garish fashion, drugs, instant mysticism and freedom from parental control." ^ Pink Floyd recorded their 1967 debut album Piper at the Gates of Dawn next door to the Sgt. Pepper's sessions at London's EMI Studios. Fans believe that the Piper track "Pow R. Toc H." would derive from Pepper's "Lovely Rita", whose sessions Pink Floyd were witness to. ^ a b c d e f g h i "Pop/Rock » Art-Rock/Experimental » Prog-Rock". AllMusic. ^ O'Brien, Lucy M. "Psychedelic rock". Encyclopædia Britannica. Retrieved 3 December 2016. ^ a b c d e f g h i j k l "Art Rock". Encyclopædia Britannica. Retrieved 15 December 2011. ^ Anon (n.d.). "Kraut Rock". AllMusic. Retrieved 25 January 2017. ^ Hegarty & Halliwell 2011, p. 224. ^ Reynolds 2005, p. 4. ^ a b Campbell 2012, p. 393. ^ a b Jones 2008, p. 49. ^ a b Edmondson 2013, p. 146. ^ Murray, Noel (28 May 2015). "60 minutes of music that sum up art-punk pioneers Wire". The A.V. Club. ^ a b c d Campbell 2012, p. 251. ^ a b c Bannister 2007, p. 37. ^ Bannister 2007, pp. 37–38. ^ Frith & Horne 2016, p. 98. ^ "Key Terms and Definitions". Archived from the original on 3 May 2008. Retrieved 16 March 2008. ^ Campbell 2012, p. 845. ^ Eder, Bruce, "The Early History of Art-Rock/Prog Rock", All-Music Guide Essay, Vanguar Church, archived from the original on 24 January 2008 . ^ a b Edmondson 2013, p. 1233. ^ Julien 2008, pp. 30, 160. ^ a b Holden, Stephen (28 February 1999). "MUSIC; They're Recording, but Are They Artists?". The New York Times. Retrieved 17 July 2013. ^ Rosenberg 2009, p. 179. ^ Bannister 2007, p. 48. ^ Williams 2003, pp. 15–16. ^ Williams 2003, p. 38. ^ a b Edmondson 2013, p. 890. ^ Schinder 2007, p. 111. ^ Bannister 2007, p. 39. ^ Carlin, Peter Ames (25 March 2001). "MUSIC; A Rock Utopian Still Chasing An American Dream". The New York Times. ^ MacDonald 1998, p. xiv. ^ Frith 1989, p. 208. ^ MacDonald 1998, pp. xiii–xiv. ^ Lindberg et al. 2005, pp. 104–06. ^ Goldstein, Richard (26 April 2015). "I got high with the Beach Boys: "If I survive this I promise never to do drugs again"". Salon. ^ Bannister 2007, pp. 26, 45. ^ Bannister 2007, pp. 40, 44. ^ Howard 2004, p. 64. ^ Perone 2004, p. 23. ^ Spitz 2005, p. 595. ^ Frontani 2007, p. 122. ^ Sculatti, Gene (September 1968). "Villains and Heroes: In Defense of the Beach Boys". Jazz & Pop. teachrock.org. Archived from the original on 14 July 2014. Retrieved 20 June 2017. ^ Campbell 2012, p. 250. ^ Jones 2008, p. 56. ^ Grevatt, Ron (19 March 1966). 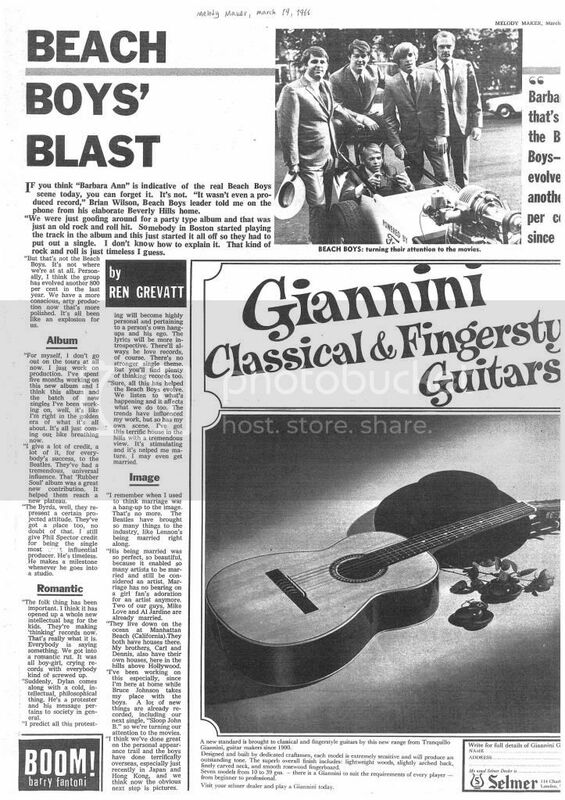 "Beach Boys' Blast". Melody Maker. ^ Leaf 1985, p. 74. ^ Sommer, Tim (21 July 2015). "Beyond the Life of Brian: The Myth of the 'Lesser' Beach Boys". The New York Observer. ^ Kent 2009, pp. 23–24. ^ Davis, Stephen (22 June 1972). "Pet Sounds". Rolling Stone. ^ "Pet Sounds". Cue. 40 (27). 1971. ^ Perone 2004, pp. 118–19. ^ Howard 2004, p. 2. ^ Rodriguez 2012, p. 138. ^ Greene 2016, pp. 9, 21–22. ^ Everett 1999, p. 67. ^ Rolling Stone staff (31 May 2012). "500 Greatest Albums of All Time: 3. The Beatles, 'Revolver'". rollingstone.com. Retrieved 22 July 2017. ^ Everett 1999, p. 95. ^ Rodriguez 2012, p. xiii. ^ "Classic Albums: The Velvet Underground - The Velvet Underground & Nico". Clash Music. 11 December 2009. Retrieved 28 March 2015. ^ Unterberger 2009, p. 122. ^ a b Bannister 2007, p. 44. ^ Unterberger 2009, pp. 6, 358. ^ Bannister 2007, p. 45. ^ Gensler, Andy (28 October 2013). "Lou Reed RIP: What If Everyone Who Bought The First Velvet Underground Album Did Start A Band?". Billboard. New York. ^ Campbell 2012, pp. 213–214. ^ a b c Jones 2008, p. 50. ^ Julien 2008, pp. 158–160. ^ Larkin, Colin (2006). Encyclopedia of Popular Music. 1. Muze. pp. 487–489. ISBN 0-19-531373-9. ^ Edmondson 2013, p. 184. ^ Geslani, Michelle (14 November 2014). "Nick Mason details Pink Floyd and The Beatles' first encounter in 1967". Consequence of Sound. ^ Goble, Blake; Blackard, Cap; Levy, Pat; Phillips, Lior; Sackllah, David (8 January 2018). "Ranking: Every David Bowie Album From Worst to Best". Consequence of Sound. Retrieved 21 October 2018. ^ a b Trakin, Roy (February 1981). "The New English Art Rock". Musician (30). Bannister, Matthew (2007). White Boys, White Noise: Masculinities and 1980s Indie Guitar Rock. Ashgate Publishing, Ltd. ISBN 978-0-7546-8803-7. Campbell, Michael (2012). Popular Music in America:The Beat Goes On. Cengage Learning. ISBN 1-133-71260-6. Edmondson, Jacqueline, ed. (2013). Music in American Life: An Encyclopedia of the Songs, Styles, Stars, and Stories that Shaped our Culture. ABC-CLIO. ISBN 978-0-313-39348-8. Everett, Walter (1999). The Beatles as Musicians: Revolver Through the Anthology. New York, NY: Oxford University Press. ISBN 978-0-19-512941-0. Frith, Simon (1989). Facing the Music: A Pantheon Guide to Popular Culture. London: Pantheon Books. ISBN 0-394-55849-9. Frith, Simon; Horne, Howard (2016) . Art Into Pop. Routledge. ISBN 978-1-317-22803-5. Howard, David N. (2004). Sonic Alchemy: Visionary Music Producers and Their Maverick Recordings. Milwaukee, WI: Hal Leonard. ISBN 0-634-05560-7. Jones, Carys Wyn (2008). The Rock Canon: Canonical Values in the Reception of Rock Albums. Ashgate Publishing, Ltd. ISBN 978-0-7546-6244-0. Julien, Oliver (2008). Julien, Olivier, ed. Sgt. Pepper and the Beatles: It Was Forty Years Ago Today. Ashgate. ISBN 978-0-7546-6708-7. Kent, Nick (2009). "The Last Beach Movie Revisited: The Life of Brian Wilson". The Dark Stuff: Selected Writings on Rock Music. Da Capo Press. ISBN 9780786730742. Leaf, David (1985). The Beach Boys. Courage Books. ISBN 978-0-89471-412-2. Reynolds, Simon (2005). Rip it Up and Start Again: Postpunk 1978-1984. Penguin Books. ISBN 978-0-14-303672-2. Rodriguez, Robert (2012). Revolver: How the Beatles Reimagined Rock 'n' Roll. Milwaukee, WI: Backbeat Books. ISBN 978-1-61713-009-0. Rosenberg, Stuart (2009). Rock and Roll and the American Landscape: The Birth of an Industry and the Expansion of the Popular Culture, 1955-1969. iUniverse. ISBN 978-1-4401-6458-3. Schinder, Scott (2007). "The Beach Boys". In Schinder, Scott; Schwartz, Andy. Icons of Rock: An Encyclopedia of the Legends Who Changed Music Forever. Westport, Connecticut: Greenwood Press. ISBN 978-0313338458. Spitz, Bob (2005). The Beatles: The Biography. New York, NY: Little, Brown and Company. ISBN 1-84513-160-6. Unterberger, Richie (2009). White Light/White Heat: The Velvet Underground Day by Day. Jawbone. ISBN 978-1-906002-22-0. Williams, Richard (2003). Phil Spector: Out of His Head. Music Sales Group. ISBN 978-0-7119-9864-3. Gendron, Bernard (2002). Between Montmartre and the Mudd Club: Popular Music and the Avant-Garde. University of Chicago Press. ISBN 978-0-226-28735-5.